If there is one art form that will come to define the 21st century, it will be collage. The internet has made visual resources abundant and all of us — from fine art painters to filmmakers, musicians to moms, designers to teenagers — use this imagery to make art, populate Pinterest boards, and organize memories. This century will be described as a remix culture — we sample and borrow, remix and reuse, appropriate and, yes, collage. Collage techniques have been employed since the invention of paper in China around 200BC. But the modern use of collage — the way we think about it as cutting things apart and putting them together in new ways — emerged in the early 1900s out of the Cubist movement when Picasso and Braque began pasting ephemera into their paintings. Braque cut up pieces of wallpaper to add to his charcoal drawings and Picasso soon followed, adding bits of cloth into his own paintings. 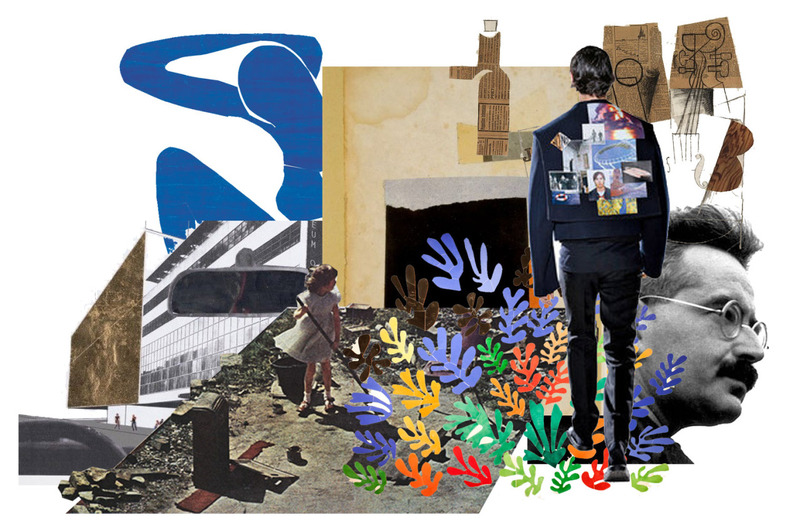 Collage — and its many subgenres including photomontage, decoupage, and mosaic — has found its way into every movement, with every medium, in contemporary art: the Surrealists used collage extensively, pop artists like Lichtenstein and Warhol worked in collage, David Hockney used his own photography as a base for collages, and Matisse, late in his career as he began losing mobility, famously turned to cutting up pieces of paper to create colorful murals. Left: 2x4's Prada Wallpaper. Right: Raf Simons' 2015 Spring collection. Collage has become the defacto metaphor for post-modernism and it isn’t limited to the fine arts. The montage became a popular film trope. Sound collage, or sampling, has increasingly become popular in music composition. In the 1960s, architects like SuperStudio and Rem Koolhaas used collage to imagine alternate futures and impossible architectures. In design, 2x4 frequently employs collage in their epic wallpapers for Prada’s flagship store in SoHo, Raf Simons’ 2015 Spring collection subverted the moodboard form by printing his influences directly on the garments, and Ed Fella has been producing paper collages for over a quarter-century. Walter Benjamin described his epic Arcades Project to a friend as his attempt to use collage in literature. The journalist Janet Malcolm — who also works as a collagist — found inspiration in her visual work when writing Forty-One False Starts, the New Yorker profile of the artist David Salle, when she assembled the profile as a series of forty-one possible first-paragraphs, reminding me of Woody Allen’s voiceover at the beginning of Manhattan. And a few years ago, Jonathan Letham wrote an essay on plagiarism and influence, The Ecstasy of Influence, which he assembled by borrowing — collaging — every paragraph from preexisting texts into something wholly new. I have a vivid memory of visiting the Philadelphia Art Museum as a high student and seeing Robert Rauchsenberg’s 1963 piece, Estate, and being immediately struck by its vibrant collage-like aesthetic. Rauschenberg was beginning to move off the flat canvas, fixing objects on to his canvases to break the two dimensional plane for new pieces he was calling “combines” — a sort of elaborated collage. You could trace much of my early work back to that single artwork. 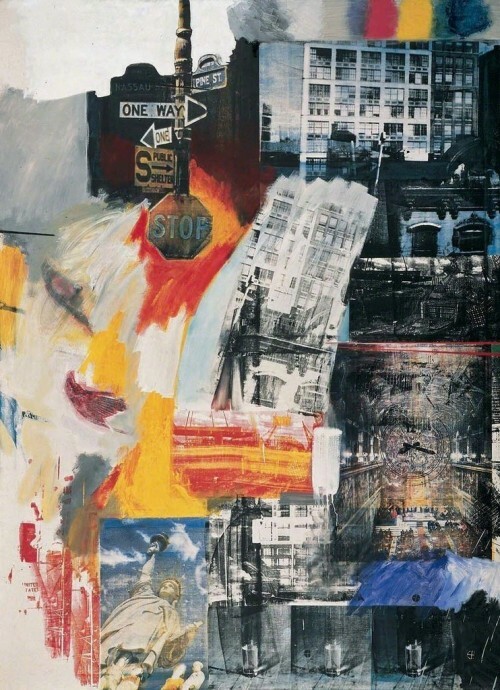 I was drawn to Rauschenberg’s use of layering, of mixing imagery, and combining photos, drawings, and objects. Years later, collage has remained a seminal touchstone to which I habitually return. I’ve been wondering why this medium has held my interest for so long. Why do I find myself continually drawn to artists working in collage? And why does so much of my own work employ collage methods and aesthetics? When I started looking, I quickly realized that everyone I was interested in and inspired by were working the same way. Collage is synecdochic of the creative process. It’s our process made visual. The design process always begins with collage. We may have moved from the traditional cut-out and pinned-up moodboards to digital Pinterest boards — but the action is the same: we pull from our influences and inspirations, using the fragments of what came before in search of something new. Design is both a noun and a verb, the action and the artifact and so is collage. It is a noun — a complete object — but also a verb — the action of collaging, of connecting disparate parts into a coherent whole. In my first design classes we learned about gestalt, that “the whole is greater than the sum of its parts”. Collage reflexively teaches gestalt — a single work that also reveals the individual elements. All design is, in essence, collaged. It’s is taking preexisting forms — shapes, typography, images — and collaging them into a coherent whole. And the same is true for the writer — where the designer pieces together shapes and imagery, the writer pieces together words. A sentence a collage of words; a paragraph a collage of sentences.